What are Elongated Vowels in Japanese? As you learned in the beginning of this course, the Japanese language only has five vowels. But if that’s true, then what the heck are Elongated Vowels in Japanese? Since there are such a small number of different vowels in the language, it is pretty common for one vowel sound to be immediately followed by the same vowel sound. For example when か is followed by あ it sounds like [kaa]. In order to make this sound correctly, you have to hold the あ sound for twice the length as you normally would if you were only saying か. This brings us back to something that exists in Japanese that I only touched on before: Mora. If we reuse the above example, we can see that か is one mora and あ is one mora. Put them together and you have かあ which is two mora. Side note: the word “mora” is both the singular and the plural of the word. Now here’s the critical point to understand: mora are not the same thing as syllables! The word かあ is one syllable, but has two mora. the word かた has two syllables and has two mora. Try saying both of the words yourself. Can you see and hear the difference between mora and syllables? I want you to fully understand this concept of what a “mora” is and what it is not, since they are going to play a very large role in Section Two of this course. So, What Else is there to Elongated Vowels? The concept is simple enough, “hold the vowel sound for twice as long” but in reality there are a few things that you will need to be aware of. The first thing you should know is that, generally speaking, the elongated vowels will sound like one continuous sound. BUT, there will occasionally be words that reiterate the vowel halfway through. It’s not all that common, and it’s rare when people are speaking quickly since it takes a little extra effort to do correctly, but it does occur often enough to mention it here. As you can see, there’s just the tiniest of dips at the end of the [a] vowel in the た mora, so that it can go back up to full force at the beginning of the あ mora which uses the same [a] vowel sound. This is a little bit different from when we completely switch syllables in a word, which I’ve illustrated with the white circles. The next thing I want to talk about with elongated vowels is that, as an English speaker, you will probably have an unconscious tendency to put stress on the syllable that contains an elongated vowel. The English language is what’s known as a “syllable stress language” which is why we emphasize one part of a word over its other parts. The Japanese language however is not like this. The Japanese language does not stress syllables! I’ll go into depth on this concept in a later lesson, but for now I just want you to be aware that when it comes to elongated vowels in Japanese, you should speak each syllable in Japanese with an equal amount of force. Something else that you should know is that that written part of Japanese can be a little tricky when it comes to visually representing two of these elongated vowels. I’m talking about the elongated え [e] and お [o] sounds. Generally speaking, when the え [e] sound is elongated it will be written with the hiragana い for the second mora, but it should still have that [e] sound to it. Likewise, when the お [o] sound is elongated in written form, it will usually be written with the う kana for that second beat, even though the sound should still be [o] for all intents and purposes. 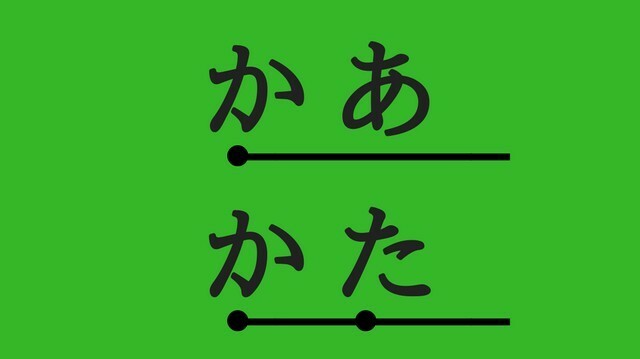 Now there are expectations to the above rules, meaning sometimes you’ll see え and お written for the second mora, or sometimes the い and う actually are the [i] and [u] sounds respectively, but by far the majority of the time you will see い and う used to represent the elongated vowel of [e] and [o]. I would like to take this moment to tell you that there are going to be quite a few situations like this, where a hiragana is used in Japanese to represent a different sound that what is actually spoken. Unfortunately, it’s just something we all have to deal with. Remember to always follow your ears, as it is the verbal part of the language that is most important. The written part of the language has been changed many times over the years, but it has always been a reflection of the spoken language. Anyway, I tell you this because you are going to see some Japanese words in the examples like ゆうめい (famous) but you should pronounce it like yūmē (or yuumee) holding that [e] sound in め [me] for both mora. Hopefully I haven’t overwhelmed you with information in this lesson! We’ve gone over what elongated vowels are, and the common things you need to know about them when it comes to hearing them, and also reading them. Let’s get into some example words now to get used to them. I’ve thrown in a couple of words that do not have elongated vowels in them, so that you can compare and contrast them to the ones that do have elongated vowels. Pay particularly close attention to those word pairs. What’s the Homework this time? All you need to do is listen to and repeat the example words three times. Pay special attention to the elongated vowels and how they sound. Remember, they do not receive any extra force, just more “air time” if you will. Once you’re done with that, it’s time to move on to the opposite of elongated vowels: Stop sounds! Go Back to Lesson 16!